Here, does the word “Fairy Glamour” take on a whole new meaning: that of a multi-coloured rainbow, both Fairy and Dragon! It feels as though this Fairy Realm, is within a totally “alien world”; which I feel is supported, by the “odd looking” ocean wave at the bottom of the image – as it seems a little “too tall”, and “out of place”. The multi-coloured rainbow effect, is particularly strong upon the Dragon’s face, and upon the Fairy’s Wings. The Height of Fairy Glamour perhaps? And in those heights, do I find an oddity within the centre of this image, as it appears that this Fairy’s Wand, gives rise to bubbles; which could be construed, as a Fairy Realm that’s Under the Sea 🙂 As it seems to me, that those bubbles are “rising” to the surface. But what of the Dragon’s Eyes? To me, they seem rather large! As do the Dragon’s Talons, which appear to be grasping/clenched. As such, does it appear at first glance, that this Dragon is hostile towards the Fairy; especially with his tongue “licking out”. But here, do I find more Fairy Glamour 🙂 For if you look at the Fairy’s face, then it appears that she is totally at ease, sitting upon/within her large pink flower! And “what a flower” she sits within: as this flower, is more akin to a Flower Fairy’s Throne. In pretty pink, it contrasts with the blue. In Begonias pink, it blooms with the hues of an undersea Anemone. For this Flower Fairy, also goes by the name, of “Warrior Fairy”. It’s as though she wears, Golden “battle armour” Jewellery, and has “little need” for anything else. The Jewellery appears in “Tribal Shapes”, that is wrapped primarily around her arms and legs; making it feel like she’s a Fairy Warrior Queen, to be reckoned with! Who just-so-happens to have a Battle Dragon, who accompanies her, when she’s travelling through this “Fairy Realm of Fairyland”. Winter Fairies may be found within the Woods of many a Frozen landscape – with one of my favourites, being the Fantasy Realms of Tinkerbell! Now, I have heard that it is their Pixie Dust, that transforms an Autumn landscape – both in terms of Frost, and in terms of Snow. But what then, would we expect of a Winter Fairy Dragon Queen? A Winter Fairy – Riding her Horse, through Winter Woods – Whilst chatting with her Black Dragon. Does she ride through the woods this Night? With Gallop and Trotter, this Fairy Queen – Explores her Realm. Does she talk with the wildlife this Eve? With her ears of an Elf, and plenty of time to gossip, this Fairy Queen – speaks with her Dragon. What does her Fantasy Dragon have to say? Perhaps he speaks of the Winter Harvest, of an Acorn and it’s sleeping Tree? Perhaps he speaks of an impending Snow Storm, a mighty Blizzard of which to tell his Queen? It’s hard to say for sure, as these Black Dragons, often keep their secrets, to themselves 🙂 Although it can be said for sure, that he’s a Western Dragon, of a smaller/younger species – more of a Familiar? In any case, in this Heart of the Woods, did I find this Fairy Queen, sitting upon her Whiten Steed. It was a wallpaper scene, that could have been, straight from the pages of a Fairytale. It was an Adventurer’s Quest, where I felt the need, to put my feet up, on this Cold Winters Night. Yet here did I find an oddity: for this Fantasy Fairy, was dressed in the Blacks of the Night, with the contrasting Pinks of a Flower Fairy? It would seem as though this Fairy, had some power over, the Coldness of the Winter Snows? For she is dressed, almost as though, she’s in the Heights of Summer! Or perhaps instead, she just walks the Paths of Fairy Glamour 🙂 In any case, with the whispers of Winter, did I see this Fairy Queen, beckon her Dragon in black. The mysterious of Fairy, with the mythical of Dragon; the delicate of Fairy, with the Gathering of Snow – I had an idea! Perhaps this Fairy, whispered to her Dragon – Do you want to build a Snowman? My answer is yes 🙂 But not a Snowman, along the lines of the “Bad Snowman”, that’s found within Disney’s Frozen; more a Snowman, that’s found within, the Fantasy Realms, of my Winter Gardens. For in Paths of Snow, a Winter Fairy’s Horse does Trot. For in Paths of Snow, a Winter Fairy’s Dragon does Fly. For in Path’s of Snow, a Winter Fairy’s Dragon Queen, does Be-spell this Winter Haven, and all that come within, her Realm of Fantasy! And saying that, it is now time for me, to Be-Spell you: What song should you sing to a Snowman on his Birthday? Freeze a jolly good fellow! Freeze a jolly good fellow! And so say all of us! Within the Realms of Fantasy, can be found the Fantasy Realms, of both Elf and Fairy. Usually, these Fantasy Realms are kept disjoint. The Elves have their Kingdoms. The Fairies have their Fairyland. And this is the Way, that it has always been! So what then, would you say to a Fairy, that could also be an Elf? Perhaps she’s just a Fairy? I’ve often thought that Fairies would have human ears; and yet, the artist of the above artwork/wallpaper image, has clearly chosen to give her the ears of an Elf. In doing so, do I feel that this Fairy, has gained something of the Powers of the Elves: the ability to listen to the Sounds of Nature. For She’s a Queen of Fairy Glamour 🙂 Perhaps she’s just an Elf? I know that the Elves, walk on two feet, and that their most likely Kingdom, is that of the Woods. The greens of this Elf, makes me think of the Forests of this Earth, and of the Oldest of the Old, the Woodland Elf. Yet, the presence of her Fairy Wings, adds to confusion, and makes me think, She’s a Queen of Fairy Glamour 🙂 But is She a Fairy Queen, or an Elven Queen? It’s hard to say for sure! Yet in any case, this Fairy/Elf appears to have a further connection with Nature (such as Forest Ferns), as she has soft skin; which is implied both by her smooth curves, and delicate “human-like” appearance. She also wears some jewellery: a bracelet around her wrist, and a blue [of the Water?] ring upon her finger. In equipping this Fairy so, I feel that this Fairy is somewhat clever; yet I find myself, unable to read the expression upon her face. Perhaps anger? Perhaps watchfulness? Or is she instead, just simply musing? As she sits within this Woodland Realm, pondering to herself: Am I Fairy, Versed in Elf? What did you see? Of Jungle Flower: An Orchid in this Jungle’s grass, two twists of colour – one Lavender, one Passion. Of Butterfly: An Angel in this Jungle’s vine, two specks of chroma – one Monarch, one Danaini. Of Macaw: A Parrot in this Jungle’s branch, two tweets of song – one Chirp, one Grin. 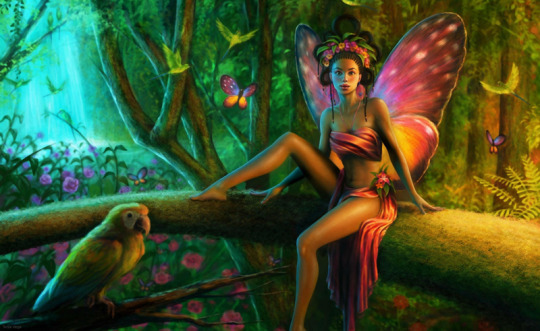 Of Jungle Queen: A Fairy in this Jungle’s cove, two shades in glamour – one Garden, one Faerie. What did she chant? The primeval of this Jungle Realm. The knowing of this Jungle Path. The airing of this Jungle Wind. The raining of this Jungle Queen 🙂 The towering of this Jungle’s Trees. The dancing of this Jungle’s Flowers. The moisture of this Jungle’s Dew. The timeless of this Jungle’s Throne 🙂 The mystery of her Jungle’s Kin. The roaring of her Jungle’s Pride. The beating of her Jungle’s Heart. The splendours of this Jungle Fairy 🙂 What did she mean? Of Parrots in this Fairyland. Of Flutters in this Fairy Heart. This Fairy Queen, of Jungle Time. Of Hornbills in this Fairy Realm. Of Bathing in this Fairy Light. This Fairy Royal, of Jungle Gem. Of Monarchs in this Faerie Place. Of Flicker in this Faerie Pool. This Fairy Light, of Jungle Glow. Of Milkweeds in this Fairy Cave. Of Shimmer in this Faerie Wave. This Fairy Queen, of Jungle Realm. So I found her 🙂 In the Heart of the Amazon. In the Heat of the Jungle. In the Shades of the Amazonian. In the Warmth of the Paradise. Sat this Fairy Queen, of Jungle Breath.